I read this article and found it very interesting, thought it might be something for you. 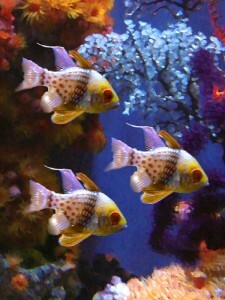 The article is called Marine Fish of the Day – Pajama Cardinal Fish and is located at https://perrysaquaticscentrelincoln.com/marine-fish-of-the-day-pajama-cardinal-fish/. The Best Fish to start with in your Saltwater Tank are Pajama Cardinal Fish. The pajama cardinal fish is one of the easiest marine breeds to take care of. It is one of the best choices for those who are just starting out with their saltwater tank. It is best for tanks of 20 gallons or bigger and grows up to 3 inches long. It is pretty easy to feed as it is an omnivore. It also is very peaceful in nature. The pajama cardinal fish is a very colorful addition to your saltwater tank. It is also known as the red spotted cardinal or the orbic cardinal. It has an average size that makes it perfect for either small or large aquariums. 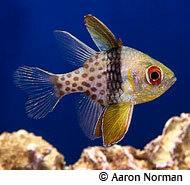 They can also work well with other pajama cardinal fish especially if they have plenty of room. So you don’t have much to worry when it comes to this type of fish. They are very peaceful in nature and are not known to be aggressive towards other fish in the tank. Since the fish is an omnivore, you can feed it some processed fish food as a start. You can also have some seaweed in your tank. You may also feed them some brine shrimp. They are not relatively picky when it comes to food. The tank conditions are pretty much general. Water temperatures must be at 74 to 78 degrees and salinity at 1.020 to 1.025. Other than this, the pajama cardinal fish will be a delight to watch with its vibrant colors and quiet nature. It is the perfect low-maintenance fish that you can get for your saltwater tank. I hate just settled 3 new fish into my marine aquarium, 2 domino damsels and 1 pajama cardinal!